Description: The single species of Northern and Central Europe lives on the leaves of trees and bushes in both decidouos and coniferous forests and has an unmistakable appearance. The bodycolour varies from light yellow-brown to dark greyish-brown. The dark lateral bands on the carapace enclose light spots. The abdomen has two pairs of approximately triangular dark blotches just behind the mid-point which are very characteristic of the species. However, these markings are obscure in older females which become dark greyish-brown at the time they guard their eggsacs. The males are able to produce audible sounds by vibrating the abdomen in order to attract females for mating. 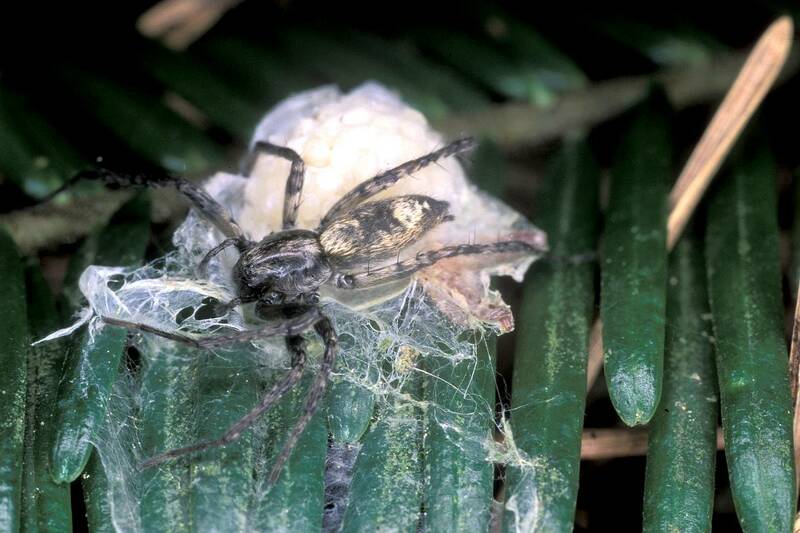 The females build retreats on curled leaves of decidouos trees and bushes or on shoots of conifers where they guard their eggsack. Size: Female 5.5-8.5 mm; male 5-7.5 mm. Genus: Anyphaena Sundevall, 1833. Characters of genus: The eyes are oval and pearly, except the anterior medials which are dark and circular. 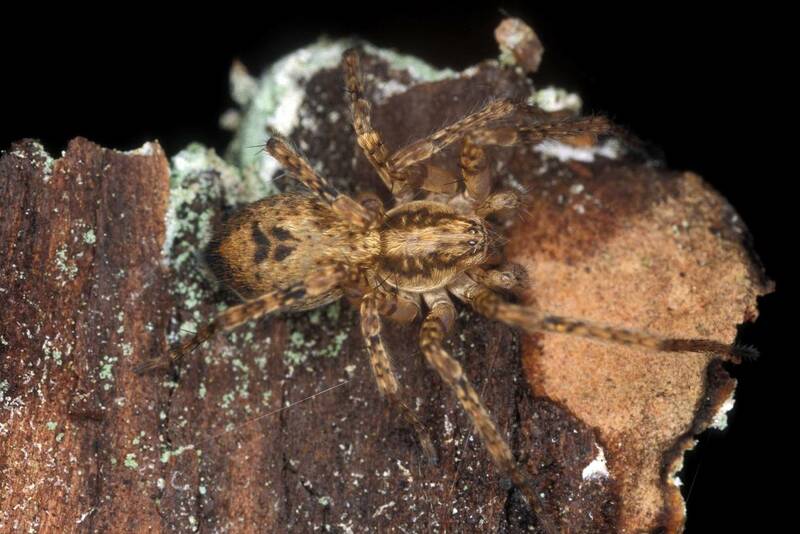 Family: Anyphaenidae Bertkau, 1878 (Buzzing Spiders). 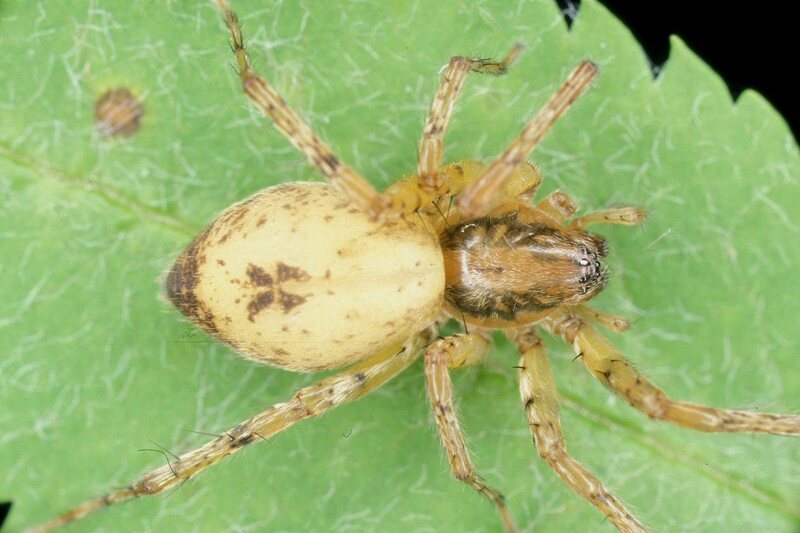 Characters of family: The superficially resemble members of the Clubionidae, but are distinguished from those by the location of the tracheal spiracle which is situated about midway between the gential groove and spinnerets. The claw tufts is composed of lamelliform hairs. The males of the Anyphaenidae also have more complex external genitialia than the males of the Clubionidae.